This post is dedicated to my friend Emma Conner, who has been telling me I’m a lunatic for never having seen this movie before. And to Alan Moore for lending it to me. Alan – two movie review shout-outs in a row! NOW can we call it even for that $4,000 you lent me? 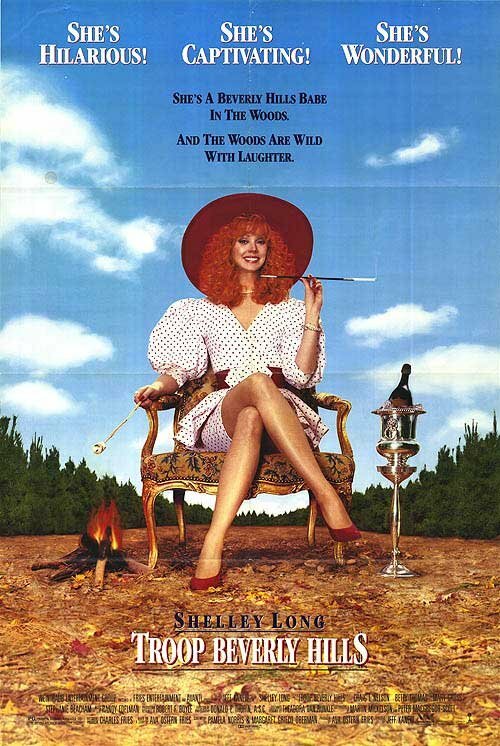 This movie stars Shelley Long, who also starred in the criminally over-watched (by me) Christmas special: The Merry In-Laws. She was also Diane on “Cheers” but whatever. I was always Team Rebecca, which I guess means I’m Team Kirstie Alley? No, I think I’m just Team “Look Who’s Talking”. Wait – what movie am I watching? Am I supposed to believe SHE dragged that heavy antique chair all the way out into the woods? Just the movie poster and already I’m being asked to suspend disbelief. 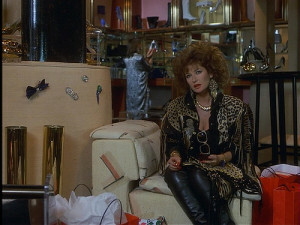 Phyllis is a rich bored Rodeo Drive housewife who’s going through a divorce from Craig T. Nelson. Coach has had it with her lavish expenses and giant hats and wants her to get the eff out. Their daughter Hannah is a savvy LA kid who has her own gymnastics beam in her bedroom and a side ponytail. 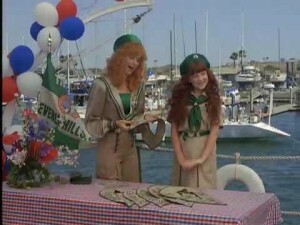 She’s also Jenny Lewis – as in the lead singer of Rilo Kiley and all around cool chick. 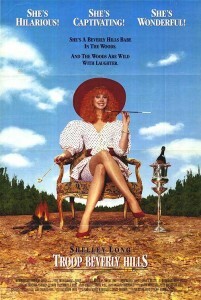 I have a sneaking suspicion she’s the only one that comes out of this movie unscathed. Anyhoodles – Hannah’s a member of the Beverly Hills Troop of the Wilderness Girls, hence Phyllis’ desire to get involved. BUT WILL THIS SUPER SHOPPER PRINCESS BE ABLE TO SURVIVE IN THE WOODS?!? I dunno, probably. 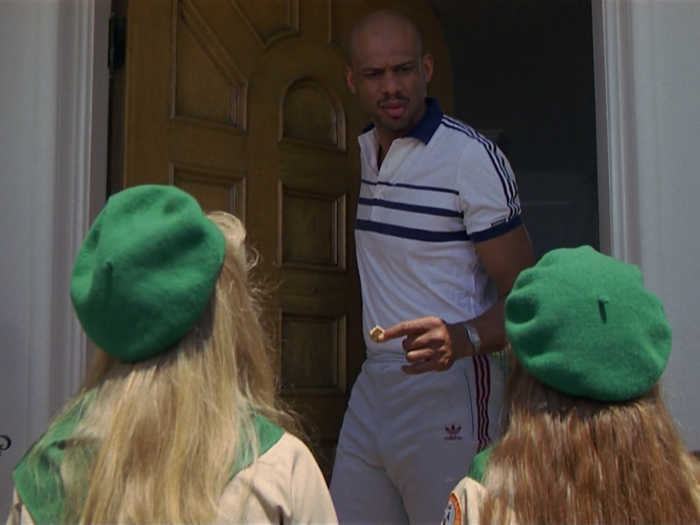 One by one the other troop members arrive at Phyllis’ house for orientation; and all these little shits are super-rich and wearing jean skirts and talking about therapy. Look who it is!!! Kellie Martin, star of “Life Goes On” and “The Christmas Ornament” and I think she was stabbed on “ER”? The girls aren’t terribly impressed with Phyllis, mentioning that none of their previous Troop Leaders stuck around long enough to even get them uniforms. But Phyllis is grrrrrreat at shopping, so she takes the girls to get fitted for their drab khaki uniforms and promises to have her gay stylist fix them right up!! Gurl, please. Joanna Stayton did it better on her yacht docked in Elk Snout. It starts to rain, which is just not crappening – in case you forgot these are Beverly Hills ladies. That’s what’s so comical!! They aren’t USED to roughing it!!! 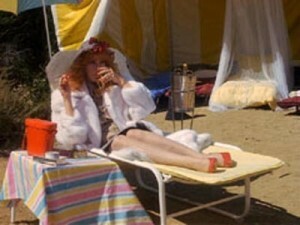 They pack up and move the campsite to the Beverly Hills Hotel, where they tell ghost stories about bad dye jobs. 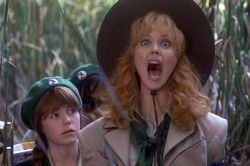 But the President of the Wilderness Girls finds out and storms into the hotel to…just yell at her? Phyllis just gets yelled out. There are no other repercussions. have peace for one afternoon?!?! Turns out her Dad is a struggling actor and they’re actually poor and she can’t afford the badge money. And by “turns out” I mean that was the first thing we learned about her, but I forgot it until just now. Sorrrrrrrrrry. Anyhoo, Phyllis sits Kellie Martin down and tells her that money isn’t the most important thing, which she has proven is complete horseshit throughout this ENTIRE MOVIE, but OK. Blah blah, some troop-mate gives Kellie Martin the money. It’s badge time, baby! When the photos the President’s spy took of the troop fail to get Phyllis destroyed, she orders the spy to move in with Phyllis. Should I have learned the spy’s name? Maybe so. Should you be judging me when I’m just trying to give you the gift of sassy reviewing? Mmmmmm. You need to turn to Jesus. How will they ever sell enough cookies? Why, with a combination dance routine / montage, of course! They sell all the cookies, and the President of the Wilderness Girls is forced to acknowledge that the Beverly Hills Troop is the NUMBER ONE TROOP ON EARTH AND POSSIBLY A FEW OTHER PLANETS I DON’T KNOW HOW THEIR RATING SYSTEMS WORK. Due to some classic rom-com miscommunication, both Phyllis and Coach want to reconcile but think the other one doesn’t, and so naturally Phyllis falls into a pool in a ballgown. 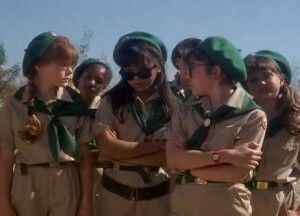 Feeling sorry for herself, Phyllis tries to bail on the troop, but the girls aren’t having it. Of course they arrive at the final (for real this time?) Wilderness Girls challenge just in time to compete. Using their “knowledge”, the girls and Phyllis traverse the harsh terrain of what I assume is a lot in Studio City. They read the map like it’s a directory in a shopping mall because women really do be shoppin’. They are sabotaged at every turn by Tori Spelling’s troop, prompting what I’m genuinely surprised is Phyllis’ first cartoonish right-at-the-camera scream. 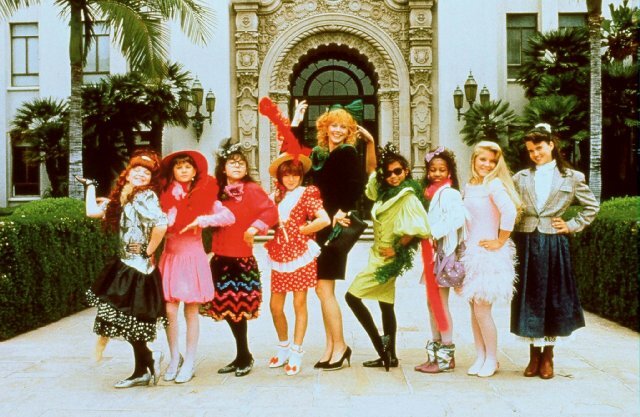 Sabotage, sabotage, sabotage; clever rich girl ingenuity, bonding. There’s a scene with Phyllis and Hannah crossing a log that took so long I got angry. 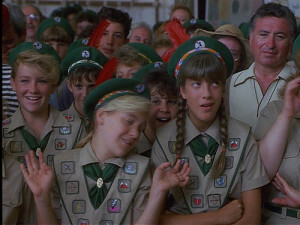 The President of the Wilderness Girls falls into a hole, and the troop stops to help her to the finish line – teaching everyone a valuable lesson about losing races, I guess. They come in second to Tori Spelling’s troop, but because Tori Spelling’s troop finished without their leader (The President), they are disqualified and – I assume – summarily executed. 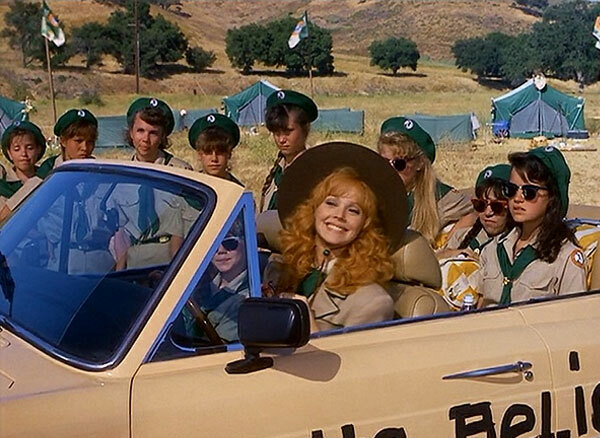 The Beverly Hills Troop wins!!!!! Coach and Phyllis reunite at the Finish Line, I assume because he always needed to be with a winner. I mean, his name is COACH for God’s sake. He’s not gonna be with someone who has a lot of PARTICIPANT trophies. A lesson children everywhere should take to heart: Win Big or Die Alone. The End. *Do you know how scared I was that I was going to type “Beverley Hills” one time? GET OUT OF MY HEAD, ROBERT DURST (MURDERER).